In an effort to make a peanut butter giveaway from my kitchen as exciting as possible, OpenSky has helped me secure a 14-cup Cuisinart Food Processor to give away to one lucky person. The exact same food processor that I have at home. 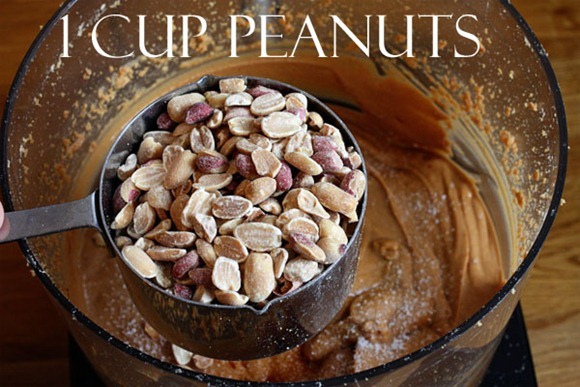 The exact same one that made this classic homemade crunchy peanut butter this morning! The homemade peanut butter comes with the prize – one for me, one for you! I absolutely love my food processor [a wedding gift from Karen!] 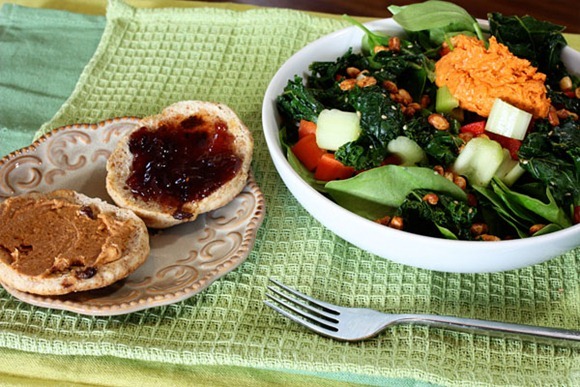 and have made everything from pimento cheese to bread crumbs to the latest – nut butters. Sign up for the KERF newsletter by clicking through to my shop below. 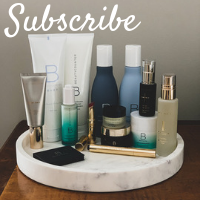 If you are already a newsletter subscriber – you are already entered!!!! Winner will be chosen on Friday! 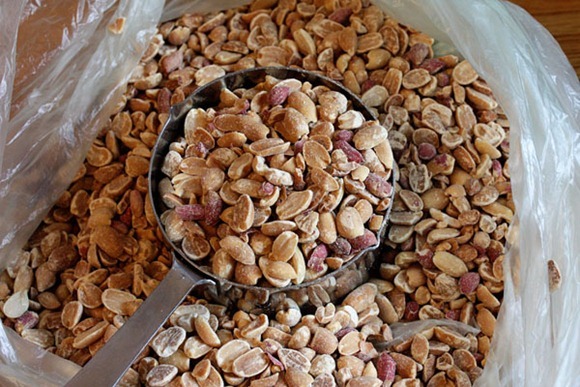 Start with 4 cups of dry roasted unsalted peanuts. I found these at the Whole Foods bulk bins labeled “peanut butter stock.” How cute. 7 minutes to a nut butter that smells just like a warm PB&J sandwich. If you like it creamy, you can add some salt and stop here. But I am a crunch-a-holic so I kept going. 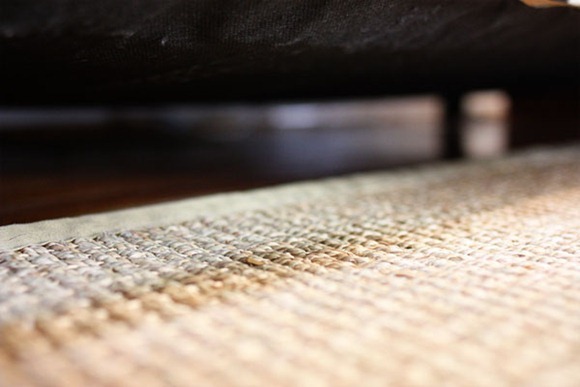 Have you ever looked under your furniture? While doing yoga the other day I happened to glance under my couch. The vacuum and I had a play day today. He is very tired now and resting from a hard day’s work. This post is brought to you by the magnetic letter 5, which was found under the fridge. 4 cups of dry roasted unsalted peanuts. 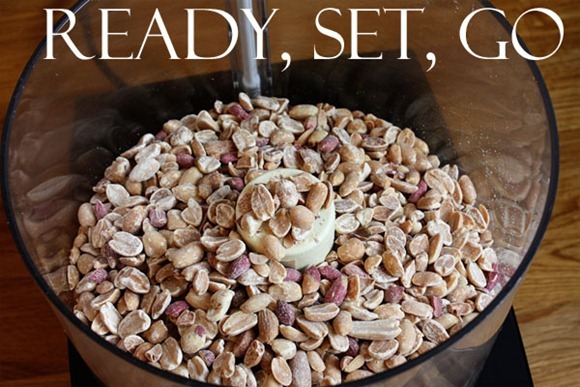 Add peanuts to your food processor and process for 7 minutes. 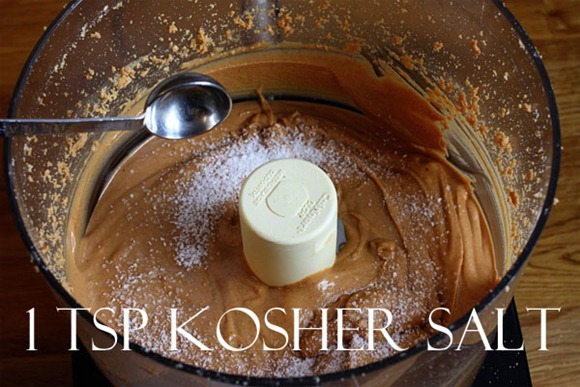 Add 1 cup peanuts, 1 tsp vanilla extract, and 1 tsp kosher salt. Oh wow… I love the 9 photos! So cool! WOW–this looks absolutely amazing! Hard to believe you can do it without any oil. Thanks for sharing! Wow, what a fab giveaway. I'm assumung it's only for American readers? The best ones always are! Never mind. Excellent giveaway, Kath! I'm going to signup for your newsletter now. I love ALL Cuisinart products! They've been a big part of cooking since I can remember. My parents loved theirs; they had 3, I believe. YUMMY @ homemade nut butter. That's on my 2011 to-do list. What a wonderful post for National Peanut Butter day!!! You do know that today is National PB Day, don't you?! Seriously! Yum! I don't think I'll ever get sick of PB. I hate cleaning under furniture! I have wood floors and a dog that sheds so there are always tumbleweeds of fur gathering under my couch. ugh. What an awesome giveaway! I've been putting off and putting off buying a Cuisinart food processor because they're so expensive…but I wish I had one so I could be more adventurous in the kitchen. oh yum, that peanut butter looks fab! Homemad peanut butter is the best! I think I'll make some today 🙂 I totally love my food processor too, but definitely wouldn't mind winning another! Looks great!! I REALLY need to hop on the bandwagon and make my own! 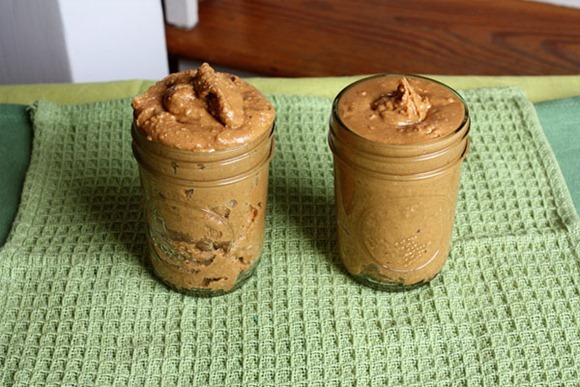 There's nothing better than fresh, homemade nut butter! That peanut butter looks awesome! Thanks for the demo on how to make it! What a fun giveaway idea! How does this food processor do with the shredder blade, like to feed stuff though the chute? I've never had one where that worked well. 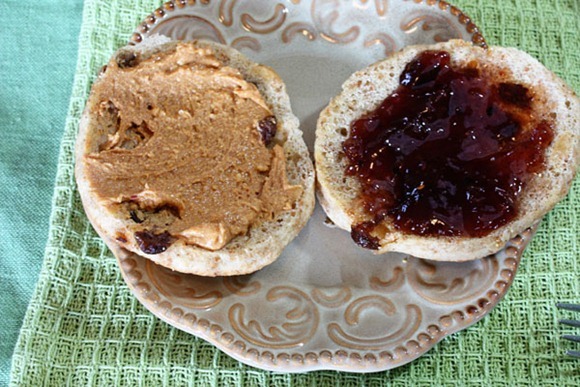 i was just dreaming about a warm PB&J a few minutes ago…how did you know?! 🙂 i’m totally making nut butter tonight! Awesome! I only have a mini-food processor right now. Oooh, looks delish! I have been researching/pricing food processors. I already subscribe, so thank you!!! I recently just moved and had to keep my food processor at my parents. I really hope I'm lucky with this giveaway. I miss making homemade nut butters and hummus. 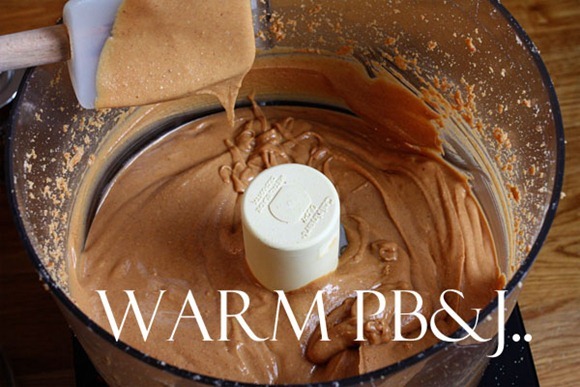 Once I get a food processor, I can't wait to make this peanut butter. 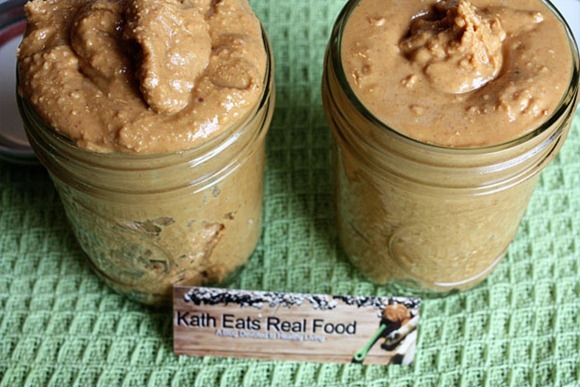 Homemade peanut butter is delicious, but I have never tried "crunchy"… yum! 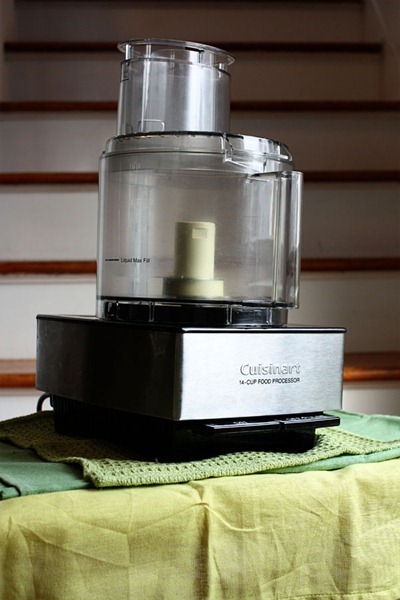 Cuisinart is the BEST brand… love 'em. I love the new look of the comments! Very cool! Hey Kath! When you buy bulk items at WF, can you recycle the plastic bag after? Or do you know if it's possible somehow to use your own reusable bag? Also, I'm curious appx how much honey you put on your salad. I'm trying to learn to eat salads without tons of Blue Cheese dressing and finding it very difficult!!! You can recycle the plastic bags. I'm pretty sure the bags are recyclable, but it may depend on what your recycling center takes. I'm lucky that mine takes everything and doesn't require presorting. I saw someone at WF this past week with her own reusable plastic container in the bulk area. She said she has them weigh her container when she arrives at the store, then they deduct the weight when she checks out. They add a *negligible* .001 of an ounce or something like that to my purchases, and work great. They ARE a fine mesh, so I wouldn't use them for millet, quinoa, nooch or flours, but for most things, they work great. (And are machine washable!). we use these for produce & bulk bin items. the added weight is pretty negligible, love supporting a family business and get tons of compliments in the checkout line! wins all around. My WF has paper bags as well, which I normally use instead of the plastic. At our grocery co-op they have a register scale with the bulk items (and stickers and pens) so you can get the tare weight and stick it right on your reusable container. I hope I win I hope I win I hope I winnnnn!! I've wanted a new food processor for well, about 2 years. I have a mini one, but no big dog! I need a food processor like that one!!! Is there a difference between stopping at 4-5 minutes and going to 7 and then adding more nuts? I only have two words: WOW and YUM!! I think I might have to eat a spoonful of PB right now! 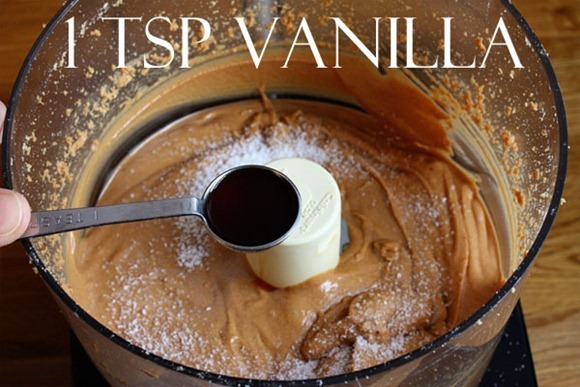 I love making my own nut butters and I always use my cuisinart processor! Love it! I highly recommend getting a roomba! I love mine and it gets under my furniture! I would love a new food processor! Mine is tiny and weak, so I've never made my own nut butters. Ugh, I just bought more PB this weekend- I always forget about making it myself! Crunchy is definitely the way to go. I vacuumed behind the fridge recently to remove a bear-sized dust bunny, and I too found a magnet! LOL. I also recently had a repairman in to fix our oven…there was some SCARY stuff under there from previous owners! 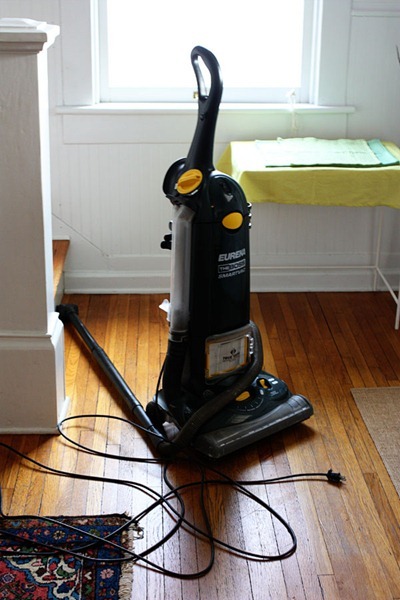 How do you vacuum behind the fridge? Do you pull it out from the wall? I'm *terrified* of what I might find. you can take your own bag to WF and they will tare out the weight for you so that you don't pay for the bag. This is what I was hoping. Thanks, I am going to try that! Hi Kath, I've been following your blog for a while, but this is my first time commenting! The peanut butter looks amazing! Would you recommend the same process for other nut butters as well? I'm dying to try to make my own almond butter, but have found so many conflicting suggestions on google. Thanks!! Yes, roasting seems to be the key! Yum! PB looks delish. I eat PB pretty much every day. An addict am I ! Perfect for national peanut butter day! Your peanut butter looks amazing! And I just signed up for your newsletter this weekend…perfect timing! 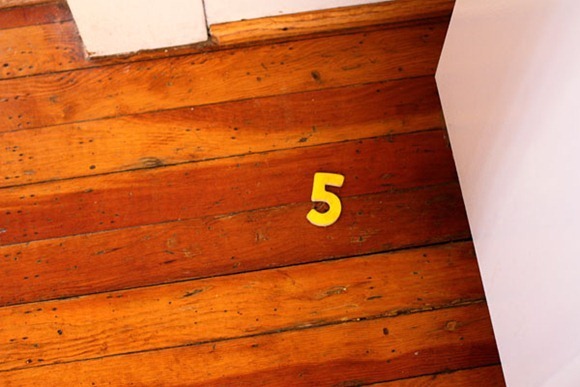 "This post is brought to you by the magnetic letter 5, which was found under the fridge"–that made me chuckle out loud. I'm absolutely going to try your peanut butter recipe!! Getting some "peanut butter stock" the next time I'm at WF. Thanks for the tutorial! I always buy my peanut butter freshly ground from Whole Foods, but this looks like a much cheaper way to get the same great taste! OHHHHHHHH! I love this new commenting system!! I was looking into switching to intense debate a while back, but some how forgot about it… May need to check it out again. I love how anyone can reply to anyone. I am drooling all over my keyboard! That peanut butter looks delicious! AHHHHHH magical peanut butter goodness!!!!!! I want to win SO bad… I only have a 4 cup processor that you have to hold the button down on to get it to work!! Making nut butter can be done but is kind of a pain! What a giveaway!!! I've been wanting a food processor, I also can't wait to try making peanut butter (although that may be a while, I just bought two jars last week) 🙁 That said, one of the jars has added maple syrup…now THAT is something I want to try with homemade peanut butter! I was practicing at home just yesterday and was frightening by a pile of dust I spied under our bed! This is a great giveaway since I burned up the last food processor making your pumpkin spice almond butter. Like it was MEANT to be! Hey Kath, you comments do look nice.. how are you liking it?!? Like it a LOT!! Because I can respond directly. Also hope it's better for you guys! If I win that food processor, I will be SO happy! I've wanted one forever, but we've just never had the money for a good one so I just keep waiting! I have my fingers crossed!! I really need to make nut butter again…thanks for the inspiration…Although from the looks of things I think it could be a bit dangerous to be alone with that peanut butter! Yipppeee! So excited for this giveaway!!!!!!!!! I could die happy if I win this food processor! Right now all I have is the mini 3 cup on its last leg, and I have already killed a previous one of that size making homemade nut butter. But it is worth it for that fresh delicious taste!!! I need that food processor VIOLENTLY. I broke our food processor last week and then my husband fixed it. A spare would be great since I'm not sure how long ours will last. I love the minute by minute guide of the making of the peanut butter! That peanut butter is really making my mouth water right now. I've only made almond butter, but I really need to make peanut butter! This looks like PERFECT nut butter!!! I can only imagine how much texture it must have with all of those whole peanuts! It would be so exciting to have a food processor. I've never had one. I enjoy trying new recipes. Your blog is so interesting. I just made peanut butter in my cuisinart food processor the other day- what a coincidense!! Yum! Holy peanut butter that looks good. My kamart brand processor is working fine, but I would love a new one! Great giveaway – looks delicious! I love it when it sticks to the roof of your mouth:) I just made raw almond butter a few days ago and NOTHING is like fresh nut butter! yum ! the pb looks AMAZING ! I have been dreaming of a Food Processor for the longest time! I think it would be wonderful to have one in college to help with cost of foods and such! Homemade hummus too! 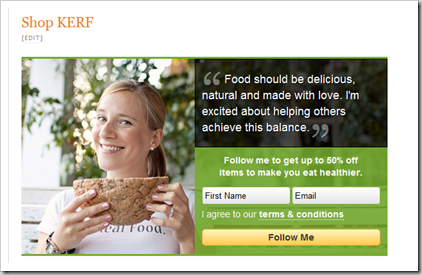 So glad that I subscribed to your KERF newsletter the other day ! Can you clarify what we're signing up for? I'd be happy to get a newsletter from YOU but I'm not sure what Open Sky is. Am I going to get a bunch of advertisements and solicitations from anyone other than you? It is a weekly email from me and opensky that features a product that I like. I have always picked out what goes out! You can unsubscribe if you hate it.. Right after I read this post, I went and ate a big scoop of chunky pb! Although, mine wasn’t home-made 🙁 I have been saving up for this exact food processor! Can’t wait until I can make my own nut butters! My mom would have a heart attack if I won a new food processor for her. But I'd give it to her anyway. All of our appliances are like the air conditioner from the Brave Little Toaster. Their motors are whirring on borrowed time. 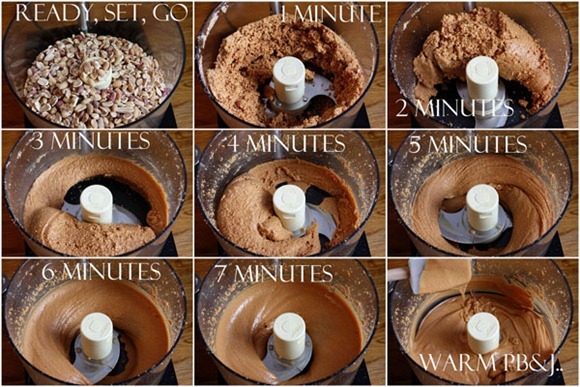 I LOVE my food processor I have the same one and make nut butters all the time including homemade nutella (yum!) but my mom's food processor just broke (it was 30 years old!) so I'm entering this for her! 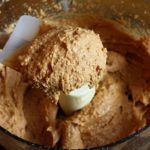 i've tried making nut butters in my cuisinart food processor, but it never seems to get as smooth as some other bloggers seem to get it…. maybe mine doesn't have as powerful a motor or something? 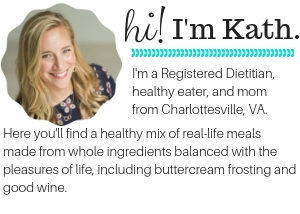 Hey Kath, love your blog!! There is just one thing I don't like about the new comment format and that is I can't easily see your response to comments. I usually just scroll down to see a comment from you and then read those comments. I guess it's just going to take time to get used to it. I use Firefox and it shows responses without having to click on anything. When I was at work using IE, I had to click to see responses. yum!!! I LOVE peanut butter!!!! I need to try this! Cool — I’m entered in a giveaway and I didn’t even know it! I will be making peanut butter in my future! Kath, do you store it in the fridge or just in the pantry? Hope I win! I’m in dire need of a food processor upgrade!! Mine is a hand me down. Let’s just say it’s way past its prime!!!! I love homemade nut butters!! Kath, did you add any oil or anything? I just tried this with some leftover peanuts that have been hanging out in my pantry and I ended up with a big, dough-like blob of peanuts that wouldn’t break down any further. It just stuck to the bottom and sides of the food processor. How DID I mess is up?! No oil, but they have to be roasted to make a good butter! Yummm! I don’t have a food processor… Wonder if it would be too hard on a blender? Probably a bad idea. I don’t think there is enough surface area in a blender..
Oh man, it looks like you have died and gone to peanut butter heaven 🙂 Must get a food processor so I can join you, haha! holy moly, this would be awesome. I miss my food processor — it got purged during the “big move” of last year, in which my husband and I and our 2 cats moved into a 10 x 10 foot cabin for six months to farm…lots of things are “missing”. 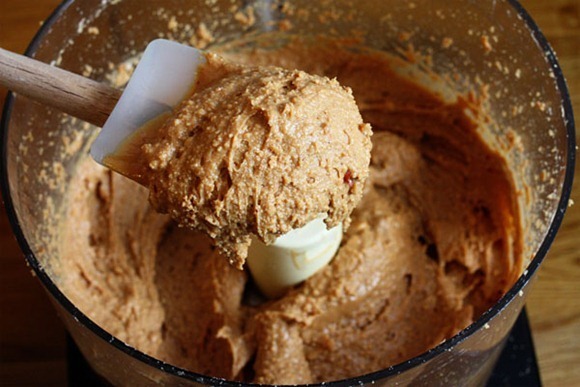 I like making almond butter in the processor…so delicious too! i am signed up and would love to enter! Yeah…wasn’t cutting the mustard. Single most annoying thing was email responding to comments was not working from my phone – when I need them most!! Also was a bit confusing and you couldn’t see my comments to comments. I have since made them green for easier seeing! Looks awesome..too bad I already own a food processor. Just think of the trouble that could be gotten into – I’m in hazelnut country…home made Nutella! Er, uh, I mean almond butter and processed veggies of course. 🙂 I’m crossing my fingers! What a great give away! How long do you have to roast the peanuts for? And how long will the nutbutter last? They were pre-roasted! Proabbly last a few weeks? What a coincidence! I am soaking some peanuts now so I can make pbutter tomorrow. I soak them, roast them then whizz them up! Huge fan of making nut butters. Just posted a coconut cashew butter but need to make CRUNCHY stat! Your comments now match your dish towel that’s pictured. And I think you used the word “minted”. You totally planned that, right? That peanut butter looks so good. I want some like right now! Sorry Tara! I’ve been messing with comment systems today. I hope it wasn’t by accident. I have a foodprocessor! And that peanut butter looks awesome! Who knew it was so easy? Totally entering! Such a fun giveaway! Off to sign up for the newsletter! Thank you so much for the minute-by-minute photo tutorial! I’ve always stopped when the nut butter is still really chucnky… I didn’t know it was even possible to get to that liquid stage with a home food processory! peanut butter, yum!!! When I finally have the extra money to get the food processor I want, original crunchy peanut will DEFINITELY be my first nut butter I make, and then endless combinations!! Hi Kath! Think if I swapped soy nuts for peanuts (for allergy reasons) I’d get the same effect? I’ve never heard of making soy nut butter, but then again, it makes sense. Give it a whirl! That looks soo good! Thanks for showing a how to, Im going to have to try to make my own soon! 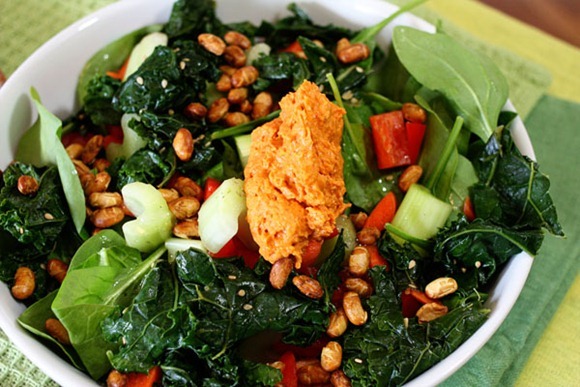 Yum- I’ve never tried making crunchy before, can’t wait to try your recipe! That peanut butter looks SOOO good! YUMMO! I made a cannellini bean and cashew nut dip this week and you popped into my head! I miss c’ville!! This post inspired me to eat peanut butter – store bought, but the all-natural kind, so I had to stir it… that makes it kinda like homemade, right? =) Great recipe and AWESOME giveaway! I need to make peanut butter, I am debating on getting a food processor to make my own PB and Coconut Butters. Even though it’d be cheaper to just buy the jars rather than buy a processor. But it would be a great investment! You started out with 4 cups of peanuts. How much of the final product did you end up with? I’m interested in the ratio or starting product to end yumminess. Thanks! I’m not sure of the exact volume, but those two jars is what I got! Maybe 3 cups? I just have to say that I just made this tonight – it. was. AWESOME! I got an entire pint plus nearly a half pint of the stuff. I used Spanish peanuts, as I didn’t find dry roasted unsalted at my local market (woo hoo, Sprouts!). The only thing I didn’t care for was the taking off of the skins (wasn’t sure how those would work). I also was able to use my homemade vanilla extract, which smelled divine. You noted that you store it in the pantry – how come? I’ve always stored PB in the fridge (my family always bought Adams brand – only peanuts and salt), so that’s where I just put it. Will it be OK in the pantry? Even when the jars are half empty (which I forsee will happen on Thursday)? Thanks for this – it was amazing, and I was so excited to finally empty out the jar of store-bought so I could make it! This is definitely a repeat! I don’t think peanut butter is required to be refrigerated for microbial growth reasons – I think it’s more about keeping the oils emulsified. I didn’t have a problem with oil separation in mine, so I didn’t chill it. I linked this page on my blog entry last night – I was so excited! 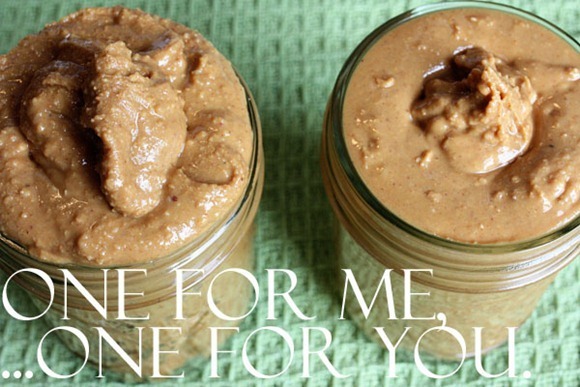 I just made this peanut butter, on National Peanut Butter Lover’s Day no less, with honey roasted peanuts! My life has forever been changed-jarred peanut butter pales in comparison! Thanks for sharing this and all of your other recipes and life updates! Your healthy lifestyle motivates me to keep going on my healthy eating and exercise New Years Resolutions! Kath, do you refrigerate your peanut butter? I made the honey crunch PB using your TJ recipe. It’s great. I doubt it will be around much longer. Sweet, gritty, salty and crunchy, what else can anyone hope for. Also, your hard boiled eggs look perfect in today’s salad. How do you make them? No Great Harvest breads around here. We’ve been missing out. Thanks for everything. Be well. You’re an inspiration to clean living and to eating at home, every meal. I find eating out disappointing these days, and, expensive. I don’t refrigerate it! Room temp keeps it drippy. ahhh, I hope I win the food processor! My mom got her food processor for her wedding 20 years ago and it still works like a charm! Ah, the good old days when producers cared more about making good quality products than stealing consumer’s money. Thankk youu very much for showing. It can become creamy without adding anything. Wonderful. Btw, wondered if I would ever reach a comment box as the comments run so long down the page.